Welcome to the site for the history of Great Warford, Little Warford, and Marthall, in Cheshire. This is the result of many years of enjoyable research, in archives, collecting photographs and and studying maps. Also the stories and memories that many of the village’s inhabitants have shared and continue to share with me have brought the area’s recent past to life, with tales of humour, goodwill and inevitably austerity and hardship. I would like to dedicate this work to the late Mr Alan Dale, (1891 – 1981) of Sandlebridge, and later, Over Peover, whose enthusiasm and dedication for collecting and preserving old parish records, and extensively researching and reconstructing local family pedigrees, has given the twenty-first century historian a wealth of sources and detail to consult, without which, this village study would not have been possible. Mr Dale’s family were a firm of agricultural engineers, Mssrs William Dale and Sons, first recorded in 1737, and were very well known in the region. The collection of Dale Papers deposited at John Rylands Library is seen as having national importance, for it’s detail on the workings of local government in the nineteenth and early twentieth centuries, and the wider agricultural economy of Cheshire. 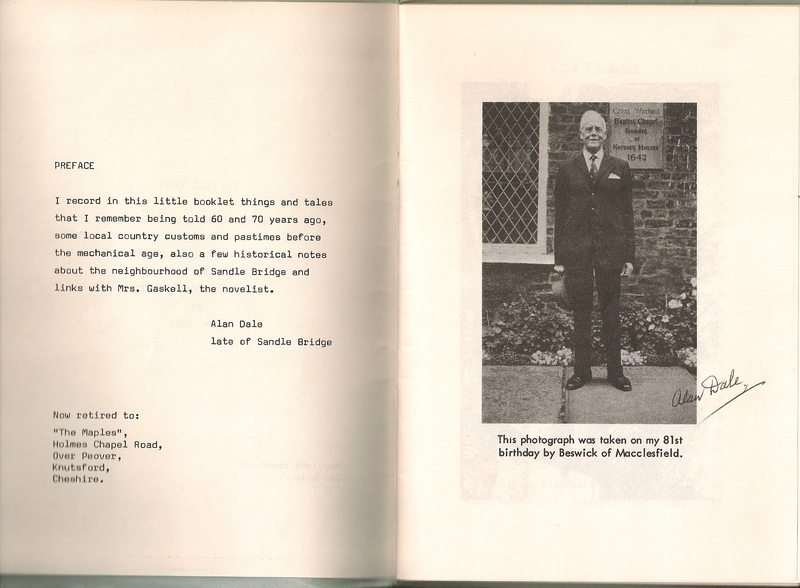 The motto of the Dale family company was “workmanship before price”, an ideal that Alan Dale must still have held dear, in his tireless work in promoting and recording the local history of Cheshire, and one that I will endeavour to adhere to also.